When our children are little we moms love their little hand prints. Footprints too. Don't want to leave out the baby toes! Hands are touch. Touch is intimate. Intimacy is bond. There aren't many stronger bonds than those between mother and child. 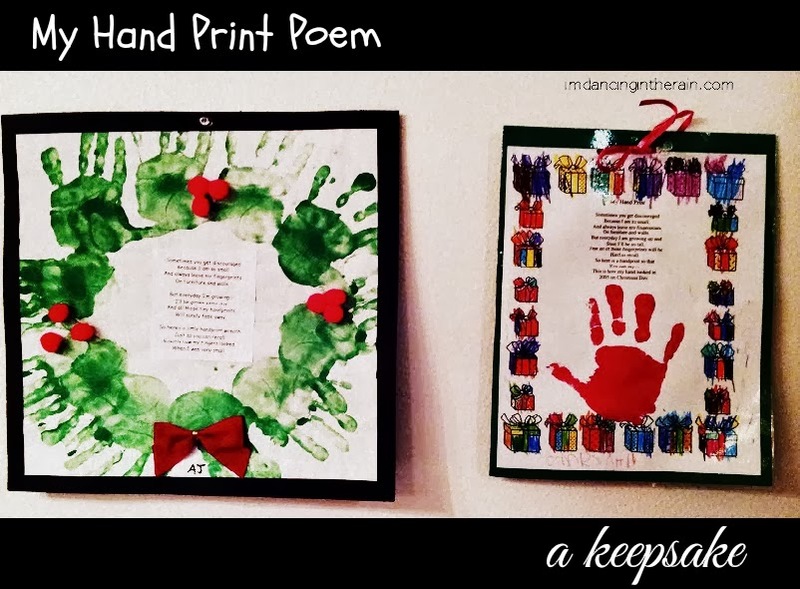 Both of my children made hand print poem keepsakes for me for Christmas when they were each in kindergarten. The one on the left is AJ's and on the right is Camryn's. These two school craft projects are my very favorites. I put them up somewhere every Christmas, and I will cherish them forever. Every year I read them and get a catch in my throat. The poems are very similar, with just a few differences. Every. Single. Mom. Out there will nod in agreement that our kids grow up way too fast. There's no escaping it. The days can drag, but the years fly by. Camryn is 13 and AJ will turn 8 next month. My babies are no more; haven't been for awhile now. Cami's feet are bigger than mine and she's nearly as tall as me. How true the line "Soon I'll be so tall" is! She can be dropped off at the movies or the skate deck, and she walks a mile round trip to the nearest gas station mini-mart. AJ is still kind of small, but growing and learning and maturing at lightening speed. All these changes. Time marching on. Kids growing up. Makes me so glad I have those keepsakes.